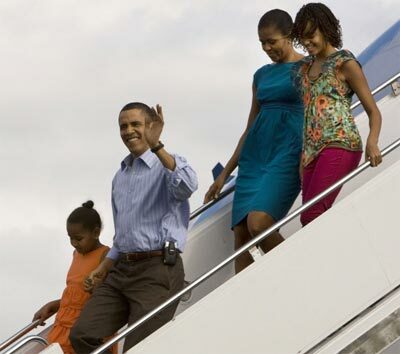 The Obama family left Hawaii last night on board Air Force One. After almost 11 full days here, it was time to go back to winter at the White House. 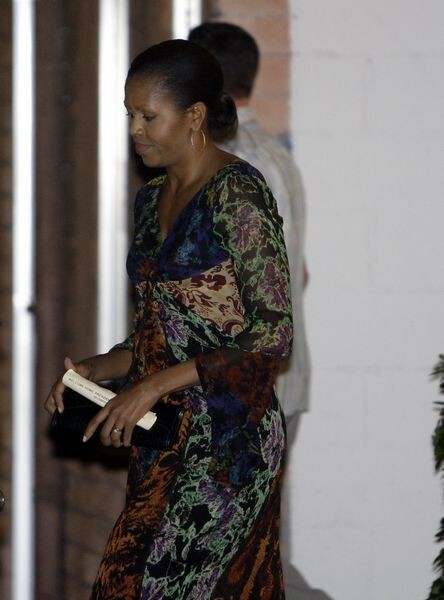 For a complete wrap-up of their trip, check out the 2009 Obama Vacation page on ArmchairHawaii.com. There are photos, maps, videos, and a complete summary of their activities here in Hawaii. President Obama played a round of golf at Mid-Pacific Country Club on New Year’s Eve. The golf course winds through Kailua neighborhoods. There were several spots along the side streets where Kailua residents gathered for a peek at the President. One lucky group got to say hello to President Obama. Luckily, someone caught this great interaction on video and posted it to You Tube. When then-Senator Obama visited Hawaii in August 2008, I thought it might be a good way to get some extra hits on my ArmchairHawaii.com website. And I was right. I figured that people planning trips to Hawaii might be interested in what he did while he was here. Thus began my coverage of the “Obama Hawaii Vacation”. 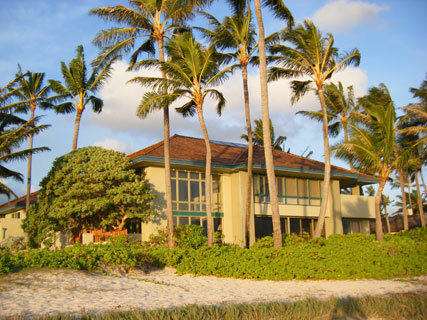 He rented a house in the middle of Kailua Beach which was shown on TV the night he arrived. I figured he would probably take a jog on the beach the next morning, so I headed over to check it out. 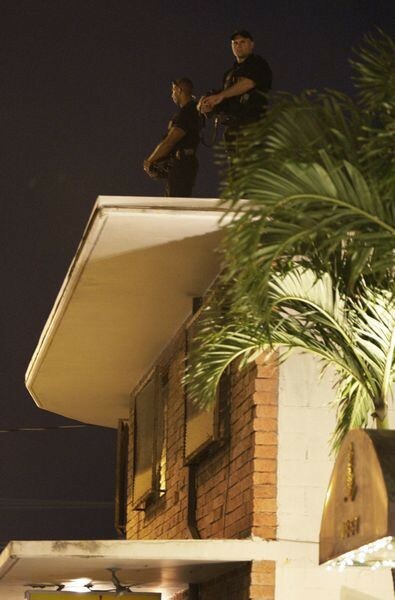 I recognized the house immediately from TV and the couple of Honolulu police guys standing around. The beach was not blocked off in front. I looked up at the house and saw Michelle standing in front of the large window looking out over the ocean. 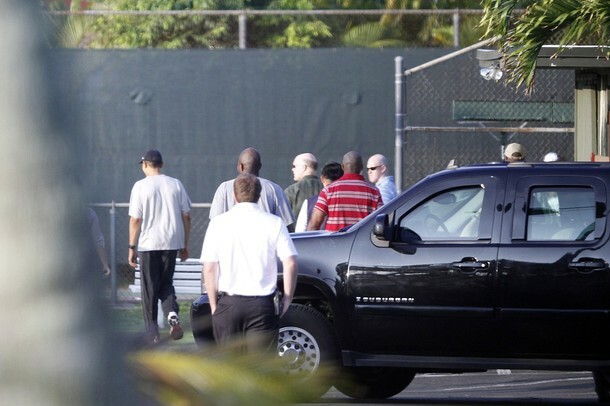 A short time later, I saw Senator Obama jogging by with about 5 or 6 guys jogging alongside. Some were friends; some Secret Service. 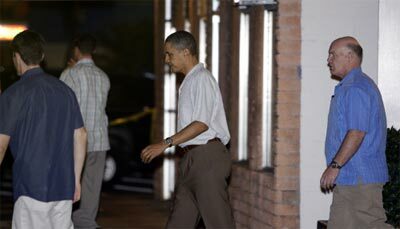 I also saw him walking back the opposite direction about 45 minutes later with three Secret Service agents. There were no crowds around. He returned to Hawaii last December as the President-Elect. This time he rented the three houses at the far end of the beach (the same ones he is in now). Beach walkers could not go all the way to the end of the beach. They were stopped by two Secret Service agents a hundred yards plus from the house. The street he was on was not blocked off at the entrance. You could walk down the street some before the point where it was closed. Now that he is President, security has obviously become a lot tighter. 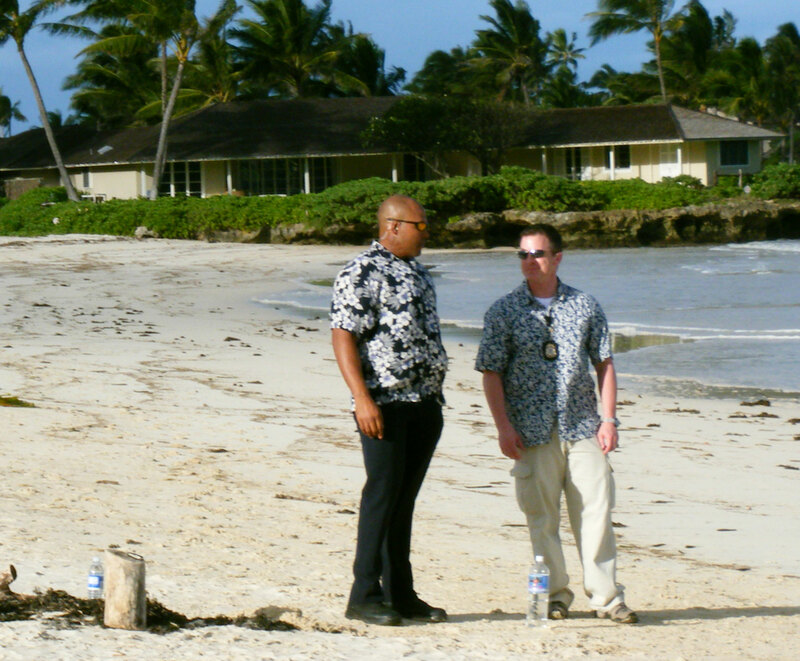 Still only two Secret Service agents on the beach (in the same spot as last year). But now there are a couple of boats constantly patrolling the water near his home. His street is completely blocked off. There is also a 10-mile no-fly zone over the Windward side. And last but not least. Remember the shirtless photos taken of President-Elect Obama last year outside his house (and who could forget…). 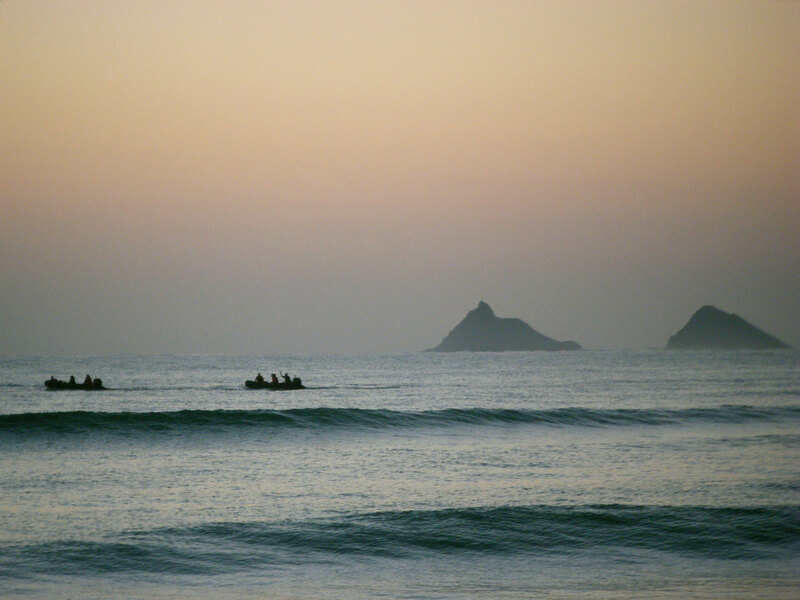 Those photos were taken by some guy with a long lens camera standing on the public side of Kailua Beach. They were displayed on the paparazzi Bauer-Griffin website, whose slogan is “Bauer-Griffin is the Hollywood Hunt Club”. Yes, they scored big last year with the shirtless photos. And they are back again this year. A few days ago, their Twitter account posted a link to photos of “Obama’s Daughters’ Christmas in Hawaii”. Don’t bother clicking on the link because the page has been taken down. So there, Bauer-Griffin. Next time stick to POTUS pecs. Here are some of the best pictures I have seen so far of President Obama’s 2009 Christmas vacation in Hawaii. 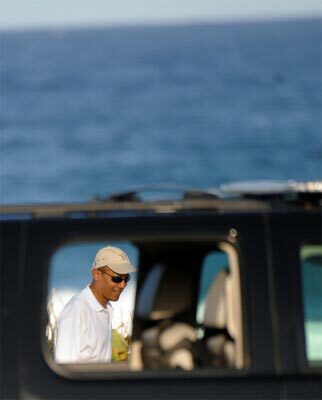 President Obama and his family arrived in Hawaii on Christmas Eve and settled into their vacation home in Kailua. 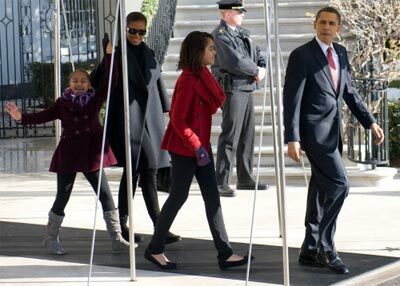 White House aides tell us not to expect to see much of President Obama as he enjoys his annual Christmas vacation. But this is Hawaii after all and he is bound to venture out to enjoy various activities around the island. Here is a handy Google map showing the various places he visits. This map will be updated throughout his visit, so come back often! You may also want to visit the Obama 2009 Christmas Vacation in Hawaii page on my ArmchairHawaii.com website where you will find photos and daily vacation itinerary updates. For up-to-the-minute news, follow @OnOahu on Twitter. 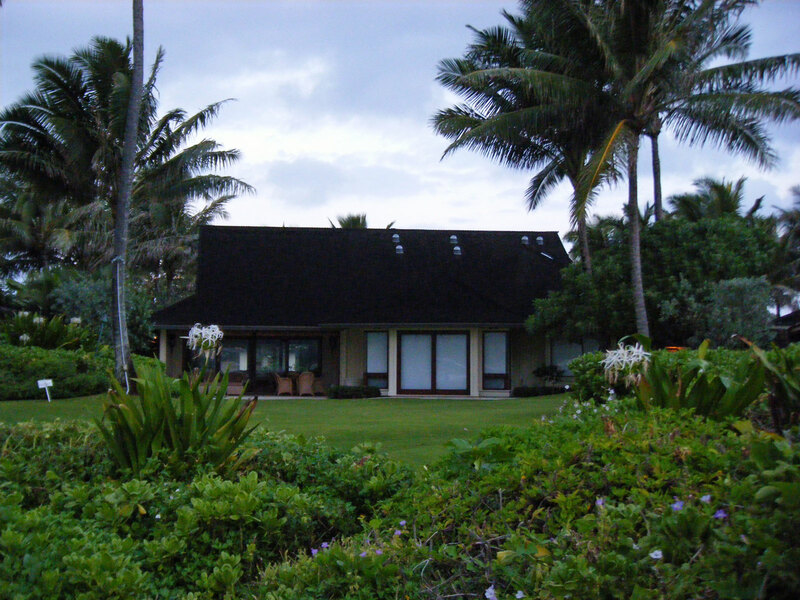 In December 2008, President Obama and his family stayed at the Plantation Estate at Paradise Point in Kailua . He is planning a return visit there this Christmas. The Paradise Point Estates website proclaims the Plantation Estate as “America’s Winter White House”. So just how nice is this place? Watch the tour of the “Winter White House” that aired on Good Morning America . The local papers here in Hawaii have reported that President Obama will return to Hawaii this year for his annual Christmas vacation. The White House has not provided any details for the trip. No public appearances are planned. One Twitter user, @OnOahu recently figured out that the President was planning to return to Paradise Point Estates, the same vacation home as last year. 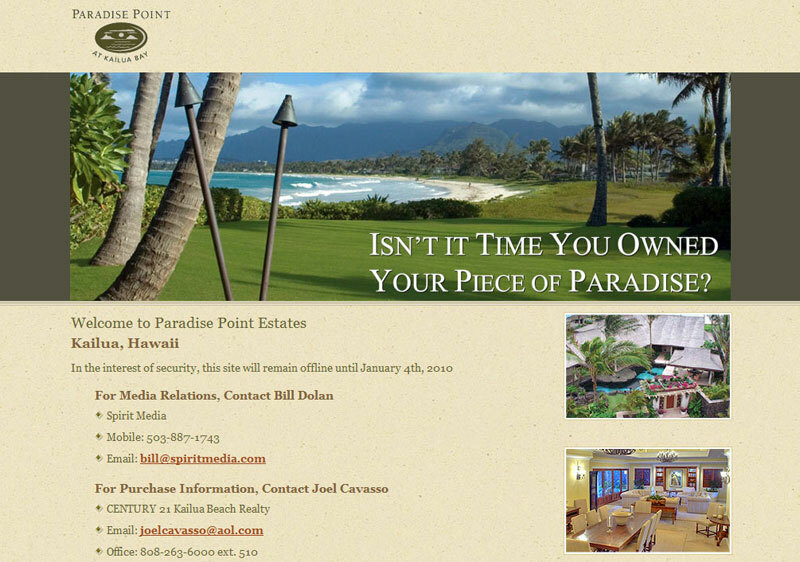 @OnOahu checked the Paradise Point Estates website which proudly proclaimed: “In December 2008 and 2009, President Barack Obama and his family personally selected the Plantation Estate as their holiday vacation home”. 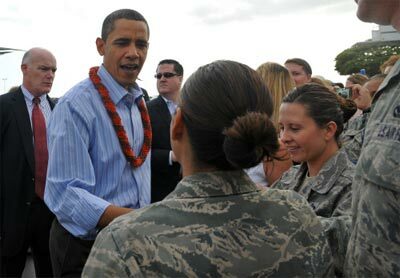 Welcome back to Kailua President Obama. We are looking forward to seeing you riding around in The Beast. For more information about President Obama’s 2009 Christmas vacation in Hawaii, follow @OnOahu on Twitter using the hashtag #obamahawaii. Every few years, the Bishop Museum hosts a dinosaur exhibit. Until now, I think the best one was back in 2002. Like I said, until now. If you have a dinosaur lover in your family, you absolutely must schedule a trip to see the new dino exhibit at the Bishop Museum, “Dinosaurs Unearthed”. Even if you don’t particularly like dinos, this exhibit is definitely worth a visit. You would think the highlight would be the full size T-Rex that stands guard outside the Castle Building. It’s huge. It moves. It roars. But wait until you get inside to see the rest of the exhibit. Many of the dino exhibits inside have motion detectors that activate as you walk by. This effect is particularly startling if you happen to catch the exhibit on a less crowded day. I made a YouTube video that shows most of the dinos in the exhibit. You can watch it here. The exhibit continues through January 4th 2010. Next week, the Mighty Mo is going into drydock to be refurbished with $18 million in repairs and upgrades. When it opens back up again at the end of January, the $20 admission price will cover a guided tour. Tourists in Hawaii will no doubt be disappointed in the coming months when the Mighty Mo is off in drydock. For more information about visting the Battleship Missouri, read my blog post “Climb aboard the Mighty Mo“. If you are a Hawaii resident, you have until the end of September to get in on a great deal from Wet-n-Wild Hawaii. For $29.99, you can purchase a special pass that will get you into the water park for free until the end of the year. Of course, by the time you buy the shave ice, hotdogs, and cokes, it’s not really “free”, which is why they are offering the deal. Considering it costs the same amount for a single day kama’aina visit, this is just too good to pass up. If you’ve been wanting to try out the new rides, now is the time to do it. For those of you who are not Hawaii residents, the park is offering a discounted adult admission of $35.99 ($4 off) until the end of the year.